Vitali Klitschko: We are preparing a little surprise. Lennox Lewis is ready. I…am too! Will WBC legendary heavyweight champions Vitali Klitschko and Lennox Lewis don the gloves and take a swing at each other, for the first time since their bloody Championship encounter of 2003? 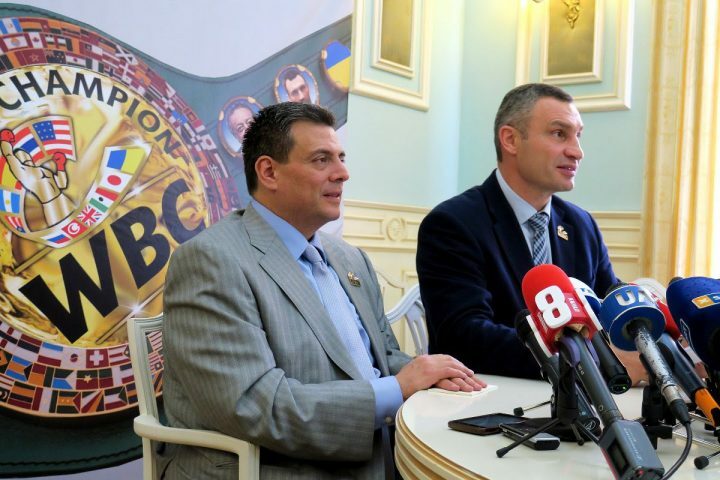 Today, the President of the WBC, Mauricio Sulaiman, and the great former world heavyweight champion and current mayor of the city of Kiev, Vitali Klitschko, offered a press conference to discuss some details about the annual WBC Convention, which will be held in this city from September 30 to October 5 at the Fairmont Grand Hotel. “In may of this year the President of the world Boxing Council (WBC) Mauricio Sulaiman signed a symbolic contract, confirming Kiev at the site of the WBC`s fifty sixth Convention. We signed it on Boxing gloves. And here are a few days left before this important event,” – said Klitschko. “I can say that this will be an interesting meeting. Let the intrigue continue. We are preparing a little surprise. Lennox Lewis is ready. I…am too!!! It`s no exaggeration to say that we expect a lot of surprises. Kyiv is the capital of Boxing! All 6 days here in the capital of Ukraine, will take place different events, shows, meeting the fans of Boxing, a charity event. But most of the Convention has working meetings, during which will decide the further development and strategy of the World Boxing Council,” said the Mayor. “I am very happy to be in Kiev. I’m not here for the first time and I can tell how the city has been changing, becoming more beautiful and modern. The weather is not very warm, but my heart is warm due to the smiles of the Ukrainians. The whole world will see what is happening here – in Kiev. I believe that this Convention will be one of the best,” said Mauricio Sulaiman. The most important boxing event of the year is the WBC Convention, as representatives of the 166 member countries meet in one place to continue developing the path that our leader, José Sulaimán destined.